Preface to Chinese Heart of Texas by Mel Brown. CHINESE HEART OF TEXAS is 100 years of history and 100 years of pride in the vibrant story of the early and modern Chinese in Texas. No other group of people faced the unique struggles and prejudices which confronted the Chinese as they chose to become Americans. And no other group of people met those challenges as well and as successfully as those travelers from the Orient. San Antonio was the perfect place they might have found to adopt as a new home as its own uniqueness fit them like a glove. The detailed telling of that tale is here with many unpublished images of the Chinese as they became Texans. Big stories and little ones all combine to make a colorful mosaic of their trials and triumphs from being undesirable aliens to kids in cowboy costumes. Then doctors, lawyers and everything in between as the Chinese became true Americans in every sense of the word. 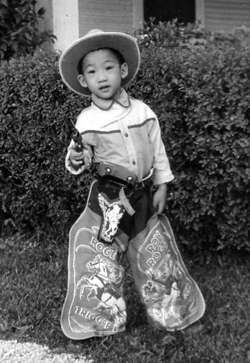 Five year old Washington Tom Lee shows off his official Roy Rogers cowboy outfit and six-shooter cap pistol at his Texas Avenue home in San Antonio about 1952. This youngster has become one of the city's most respected physicians while his brother and a sister are also MDs, one in Cal. the other in NYC. Here is a sampling of the material presented in CHINESE HEART of TEXAS that will hopefully convey the sense of discovery and fascination that I experienced during the book's research phase which took over three years and thousands of miles to complete. During that time I met average Americans who were born Chinese at a time when that was uncommon in Texas. Most of them had stories that were both familiar and unique, some that were especially worth hearing and others that were not. I spent countless hours digging through piles of books here in Austin among the stacks of the University of Texas' incredible world class library system. More hours were spent combing through head splitting, eye ball aching and mind numbing rolls of Texas newspapers microfilm from the past 100 plus years. Then there were the fun days spent walking the nearly forgotten and long abandoned Chinese railroad worker's camps in West Texas. About one hundred and thirty years ago those high desert sites in the mostly barren Trans Pecos smelled of meals being cooked never imagined by the few locals already living there. The chatter of many voices was heard speaking a very different language than was usual in those parts as the Asian men laid Southern Pacific track, built bridges and dug tunnels connecting the second great transcontinental railroad across America. 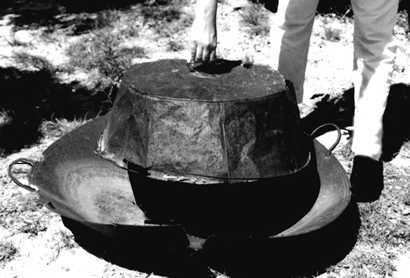 This broken wok was left behind at an 1881 Chinese camp on a ranch near Langtry. Large enough to cook for a dozen or more men, once broken, the cast iron pan and lid were abandoned. Various workers from these camps became some of the early Chinese to settle in San Antonio once the railroad construction was completed in 1882. Fast forward to just a few summers ago and we find my half Chinese daughter Leanora stopping, kicking away some sand, then pulling on a busted handle. She was soon surprised by the discovery of the lid from an old wok. A few feet away, I was crawling around on hands and knees only to find a funny little coin with a square hole in it and a couple of buttons like I'd never seen before. It was possible that they were dropped by the same daughter's Great-great-grandfather who had also worked this line but certainly not as a tourist like we were that day. That summer's road trip was a reward for my accepting the opportunity to write this book which good fortune had laid before me a year earlier. There have been other rewards and one must now be mentioned here because it's the singular story that I always tell people who asked me why I wrote CHINESE HEART OF TEXAS. Now I'm quoting from the book's Preface because it had to be told there too, "..... when beginning my formal research for the book, I learned quickly that anyone who has written of Texas Chinese in the past, relied on a 1941 masters thesis. It was written by one Miss Amy Elizabeth Nims but I'd never heard of her until beginning my look at this subject. Having acquired a copy of Amy's thesis from Texas State University, I was amazed by a coincidence found therein. It contains Amy's address as of 1941 which was 1730 McKinley Ave. San Antonio, Tx. I subsequently learned that this was her parent's home until the early 1950s. By phenomenal chance, my parents bought that very house in 1960. I lived there through my high school years, into college, then again occasionally until I married a wonderful Chinese American girl named Lorraine Lee. So begins this serendipitous Texas Chinese history." Books ordered from Mr. Brown are autographed and may have a personalized dedication added upon request.